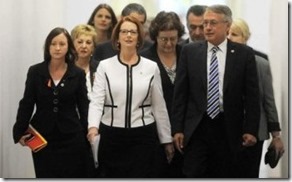 The time line of events leading from media speculation created by the media of a split in the labour party to the proposed caucus vote to choose a new leader and Kevin Rudd refusing to challenge Julia Gillard in a leadership if given below. 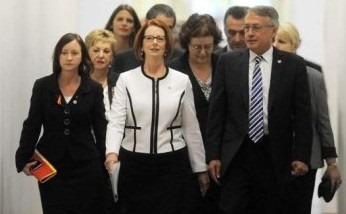 "The leadership has been settled in the most conclusive fashion possible," Ms Gillard told a press conference. 2. Coverage backed up and escalated by radio news, Online websites and Local tv channels leading to a proposed caucus vote in labor party. 3. Julia gillard calls for caucus vote to put a end to a challenge if any raised or intended to be raised and puts a end to speculation with no challenge to the leadership . Was this motivated by media agencies or corporations who did not like the current government reforms ? Was this done to destabilize the current government ? Was there bigger powerbrokers orchestrating he whole drama behind the scenes?